RIT/NTID faculty member Joseph Stanislaw, left, discusses the museum accessibility app with Musab Al-Smadi, a fourth-year software engineering student from Jordan. Art lovers who are deaf or hard-of-hearing soon will have access to a deeper, richer museum experience, thanks to Rochester Institute of Technology’s National Technical Institute for the Deaf. 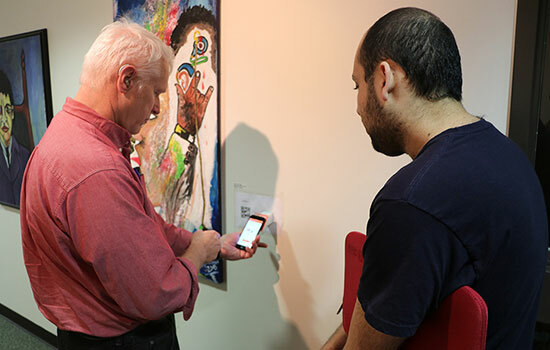 The college is launching a mobile app to be used in its Dyer Arts Center that provides content in various forms, including video in American Sign Language, transcripts and audio and visual descriptions. The app was developed by members of RIT/NTID’s Center on Access Technology in cooperation with Dyer personnel and deaf and hard-of-hearing students from two of RIT’s other colleges: B. Thomas Golisano College of Computing and Information Sciences and the College of Imaging Arts and Sciences. Wendy Dannels, a research faculty member in the Center on Access Technology, mentors several part-time and co-op student employees on this accessibility project. “It is a joy witnessing students building good character and self-confidence navigating this new technology,” she said. Information on the various art pieces can be accessed three ways: through a numbered system near each art piece that can be entered manually into the app, by taking a photo of a QR code, or though NFC, or Near Field Communication, a short-range wireless communication technology that allows two devices equipped with NFC technology to communicate with each other and share information as soon as they are close to one another. Additionally, the app, powered by Museum Accessibility Intelligence, or MUSEAI™, contains an option that has been developed for use by those with vision issues, using a dark background, large font size, visual descriptor and audio description. Brian Trager, associate director of the Center on Access Technology, foresees a huge impact in end-users’ experiences using MUSEAI. Focus groups will provide feedback as perpetual testing continues to refine the app and its abilities.